Over the next 13 days I will be traveling the state to talk about my plan to transform the lieutenant governor’s office into Wisconsin’s top taxpayer watchdog constantly focused on exposing and eliminating wasteful government spending. Last week I unveiled my first radio ad which you can listen to by clicking here. Soon I will be launching my first TV ad entitled “Taxpayer Watchdog.” You can get a sneak preview of the ad here. If you agree with my vision for the office of lieutenant governor, please donate to my campaign so I can reach more voters. -Prevent an increase in the nursing home bed tax. I am running for lieutenant governor because I want to help get Wisconsin’s economy back on track by exposing wasteful government spending. When spending is reduced, we can cut taxes to create an environment that will encourage private-sector job growth. Because of my tax cutting record, I was recently endorsed by major job-creating groups and business owners all across Wisconsin. Nearly everyone I meet along the campaign trail asks me “What does the lieutenant governor actually do? Why are you running?” My answer is simple: For as long as I can remember the lieutenant governor has been a meaningless placeholder position. I’m going to make the job meaningful by giving the office a purpose – stopping wasteful spending. It’s about time the taxpayers got a return on their investment for having a lieutenant governor in the first place. But I’m not waiting to get elected to deliver on my campaign promise. Just last week I was on Charlie Sykes's WTMJ4 show discussing a story I uncovered about the Wisconsin Department of Corrections decision to provide taxpayer funded ID cards anddrivers licenses to inmates. I was featured on NBC 15's coverage of this story, which can be viewed here. At a time when our state is broke, it is outrageous to give inmates “free” IDs when they can afford on their own. Help me transform this previously meaningless position into a taxpayer watchdog by donating to my campaign. Together we can give Wisconsin citizens a return on their investment in this office. (Madison) – State Representative Brett Davis’s campaign for lieutenant governor has won the backing of 23 state legislators. Davis announced an endorsement list today that included a broad list of legislative backers from all parts of the state. Davis has based his campaign for lieutenant governor on a pledge to transform the position into the leading taxpayer watchdog in the state with the chief mission of rooting out waste, fraud and abuse. Each year Davis serves as lieutenant governor he will propose an amount equal to at least 100 times the lieutenant governor’s office budget in wasteful government spending to eliminate. The 2011 operations budget for the office of lieutenant governor was $390,800. Under Davis’ formula he would then propose nearly $40 million in government spending cuts in his first year in office. Davis was elected to his south central Wisconsin Assembly District as one of the youngest members of the Legislature in 2004. Despite liberal special interest groups spending over a million dollars attacking him, Davis managed to win reelection twice in a district where President Barack Obama took 64% of the vote. In addition to his legislative service, Davis is a small businessman working as a Realtor for Hedeman Real Estate Company and serving as the immediate past president of the Oregon Area Chamber of Commerce. Davis has also been endorsed by Wisconsin Right to Life, Governor Tommy Thompson, the majority of Waukesha County GOP executive board members (as individuals), Congressman Mark Green and former State Representative and 2006 candidate for lt. governor Jean Hundertmark. In addition to these endorsements, Davis was leading vote getter on each of the three ballots cast in the lieutenant governor’s race at the 2010 Republican Party of Wisconsin state convention with a margin of at least 12 percent over his next closest rival. When I kicked off my campaign I pledged to transform the lieutenant governor's office into the leading taxpayer watchdog in the state with the chief mission of rooting out waste, fraud and abuse. There is no greater example of wasteful spending in government today than Jim Doyle and Barack Obama trying to force a costly and unneeded Madison-Milwaukee train on the taxpayers of Wisconsin. To help stop this boondoggle, I created www.stopthetrainwisconsin.org, which was featured on a recent TMJ4 newscast where I also spoke out against Governor Jim Doyle and the Department of Transportation’s plan to waste millions of dollars on a new train depot. I am proud to announce that today I am launching my first radio ad in an effort to spread the word about my vision for the office of lieutenant governor. You can listen to the radio ad by clicking here. If you like what you hear, please click here to make a donation so that I can run the ad on more stations. I have pledged that each year I serve as lieutenant governor I will propose to eliminate an amount equal to at least 100 times the lieutenant governor’s office budget in wasteful government spending, which would result in nearly $40 million in spending cuts each year. If you think that the lieutenant governor should work to cut wasteful government spending and like my radio ad, please click here to help get my message out to more Wisconsinites. With your help, I will be able tell taxpayers all across Wisconsin about my plan to put Madison on a diet. Please donate today and help me put the office of lieutenant governor to work for taxpayers. It’s time Wisconsin citizens receive a return on their investment in this office. Davis has also been endorsed by Wisconsin Right to Life, Governor Tommy Thompson, the majority of Waukesha County GOP executive board (as individuals), and former State Representative and 2006 candidate for lt. governor Jean Hundertmark. In addition to these endorsements, Davis was leading vote getter on each of the three ballots cast in the lieutenant governor’s race at the 2010Republican Party of Wisconsin state convention with a margin of at least 12 percent over his next closest rival. When I kicked off my campaign I pledged to transform the lieutenant governor's office into the leading taxpayer watchdog in the state with the chief mission of rooting out waste, fraud and abuse. But I’m not waiting until I’m elected to continue our fight to expose wasteful spending. Just this week I wrote a letter to State Senator Mark Miller, a member of the Democratic leadership team, asking him to reimburse taxpayers for the legal fees incurred from his failure to comply with an open records request. This lawsuit was totally avoidable and taxpayers should not foot the bill. The Milwaukee Journal Sentinel picked up on my letter and I am hopeful that public pressure will continue to build and force Senator Miller to reimburse the state. I also publically denounced the Milwaukee teachers’ union for attempting to get taxpayer funded Viagra for union members. The teachers’ union is completely out of control. The majority of 10th graders educated in the Milwaukee Public School (MPS) system cannot read or do math at proficient levels, teachers are being laid off, the district’s finances are a mess, and the union is fighting for taxpayer funded vacations and for an erectile dysfunction drug. Complete Democrat control in Madison has created bloated government that is packed full of extravagant government programs. I am running for Lieutenant Governor because I want to transform the office into the top taxpayer watchdog in the state with the focus of eliminating this type of wasteful spending. If you agree with me that the lieutenant governor should serve as a taxpayer watchdog,please click here to make a donation to my campaign. Please donate today and help me put the office of lieutenant governor to work for taxpayers. It’s time Wisconsin citizens received a return on their investment in this office. At a time when the Milwaukee Public School (MPS) District is broke, nearly 60% of 10th graders in the district can't read, and 70% can't perform math at proficient levels, the teachers union negotiated an agreement where some teachers will receive taxpayer reimbursement for spring break hotel expenses. At a time when many Wisconsin families can’t afford a vacation, it is outrageous to think that taxpayers could be on the hook for MPS teachers’ spring break expenses. MPS is in desperate need of reform and Wisconsin citizens simply cannot afford more irresponsible spending by the Milwaukee Public School District. By standing in the way of meaningful education reform, the teachers union, Governor Jim Doyle, and legislative democrats made this type of wasteful spending possible. Republican efforts to reform our public school education system and enable school districts to control costs were squashed by complete Democrat control of government in Wisconsin. When I kicked off my campaign I pledged to transform the lieutenant governor's office into the leading taxpayer watchdog in the state with the chief mission of routing out waste, fraud and abuse. The experience I have serving as the ranking Republican member on the Assembly Education Committee and working on education reform issues for 5 years while in the legislature will enable me to partner with the next Republican Governor stop this type of wasteful spending in our educational system. I will not let this outrageous example of taxpayer waste go unchecked. I will be asking the Attorney General to review the legality of using education funds for this type of expenditure. You can learn more about Brett Davis by visiting his webpage at www.votebrettdavis.com. Brett Davis’s (R-Oregon) campaign for Lieutenant Governor recently announced the endorsement of Wisconsin Right to Life, Political Action Committee (PAC). In addition to receiving the endorsement in this election, Davis has been endorsed by Wisconsin Right to Life in all of his previous elections. I am very pleased to inform you that the Wisconsin Right to Life PAC has endorsed your candidacy in the Race for Lieutenant Governor. We deeply appreciate your strong support for legislative measures that would protect the most vulnerable members of the human family and your opposition to measures that would demean the sanctity of human life. During your tenure in the State Assembly, you have been a strong and unwavering advocate for the rights of the born and unborn. We greatly appreciate your solid right-to-life-record. Should you be elected to serve as Wisconsin’s next Lieutenant Governor, we believe that you would greatly contribute to the building of a culture of life where human life is cherished, welcomed and protected. I am honored to have the endorsement of Wisconsin Right to Life PAC again this election. If given the opportunity, I will use the position of the Lieutenant Governor to continue to promote the pro-life values I have fought for over the last 6 years in the legislature. voted to ban the practice of human cloning in Wisconsin. State Representative Brett Davis received the largest percentage of votes for Lieutenant Governor in a straw poll released yesterday by the TEA Party group "The Wisconsin 9/12 Project." “My plan to transform the Lieutenant Governor’s office into a taxpayer watchdog focused on rooting out fraud, waste and abuse in state government is resonating with taxpayers around Wisconsin. My hope is to work with the TEA party movement to ensure that taxpayers finally get a return on their investment in the office of Lieutenant Governor. Each year Davis serves as Lieutenant Governor he will propose to eliminate an amount equal to at least 100 times the Lieutenant Governor’s office budget in wasteful government spending. The 2011 operations budget for the Office of Lieutenant Governor is currently $390,800. Under Davis’ formula he would propose nearly $40 million in government spending cuts during his first year in office. Results for the entire straw poll can be accessed at:http://www.thewheelerreport.com/releases/june10/june30/0630wi912projectpoll.pdf. The Wisconsin 9/12 Project plans to releasestraw poll results monthly between now and the September primary. Sen. Kanavas was first elected to the represent portions of Waukesha and Washington Counties in a July 2001 special election, was re-elected in November 2002, and recently announced this would be his last term in the State Senate. Throughout his time in the legislature Sen. Kanavas served on the powerful Joint Finance Committee and authored the Senate property tax freeze, a bill to eliminate the death tax, and several election reform proposals. I am enthusiastically endorsing Brett Davis for Lieutenant Governor. I served with Brett in the legislature and enjoyed working with him on important economic development and job creation initiatives over the last few sessions. Brett is the only candidate in this race who has direct experience working on state issues. Given the current state budget disaster, taxpayers need a hard-working conservative in the Lt. Governor’s office who will hit the ground running. Wisconsin needs Brett Davis. He is best positioned to help Republicans retake the Governor’s office this fall and immediately pass a budget that reduces state spending, eliminates the deficit, and cuts taxes. I am honored to have Senator Kanavas's endorsement. He is a conservative leader who has worked tirelessly to advance fiscally responsible policies in the State Senate. Wisconsin needs more legislators and leaders like Sen. Kanavas to fix our state’s currentbudget crisis. Our state is currently headed in the wrong direction. I share Sen. Kanavas’s vision of how to get our state back on track, which is why I am running for Lt. Governor. I want to serve as a taxpayer watchdog that reduces spending by exposing fraud, waste, and abuse in state government. In addition to this written endorsement, a video of Sen. Kanavas speaking about his support for Brett can be accessed by clicking here. If you believe that the Lieutenant Governor should serve as a taxpayer watchdog, please click here to make a donation to Brett. With your help we can keep the momentum going so that taxpayers finally get a return on their investment in the Office of Lt. Governor. Chairman Jason Johns: My fellow veterans have a stake in the race for Lt. Governor, and we’ve got a tireless advocate and friend in Brett Davis. State Representative and Lieutenant Governor candidate Brett Davis recently announced the creation of a “Veterans for Davis” coalition in support of his bid for the state’s second highest office. Davis said he is “proud and honored” to have the support of many of Wisconsin’s true heroes. “As Lieutenant Governor, I’m going to keep working to make sure Wisconsin keeps its promises to our veterans and helps repay them and their families for the sacrifices they made in keeping us safe,” said Davis. The Veterans for Davis coalition will be chaired by Jason Johns, an Iraqi war veteran from Oregon, Wis. Johns’ decorated, ten-year military career has included a year-long combat tour in the Sunni Triangle with the Platteville-based 229th Combat Support Engineers/244th Battalion/555 Brigade/4th Infantry Division, and three years as commander of the Oregon-Brooklyn-McFarland Veterans of Foreign Wars Post 10272. Johns said endorsing Brett Davis for Lieutenant Governor was an easy decision, based on Davis’ unwavering record of support for military members and their families in both the Legislature and in his personal life. “As a constituent of Brett’s, I have seen firsthand his commitment to veterans and the issues we face,” Johns said. “Brett Davis understands veterans’ issues, period. He has always shown the utmost gratitude and respect to those who have served their country, and I have no doubt that he will take that attitude to the Lieutenant Governor’s office. In the state Assembly, Davis voted twice to prohibit job discrimination based on military service, voted to improve and protect absentee balloting for troops around the world, voted to stabilize and protect the Veterans Trust Fund, and helped create the Gold Star license plate for family members of veterans who made the ultimate sacrifice. Any veterans interested in learning more about Brett Davis or joining the Veterans for Davis group are asked to visit his website at www.votebrettdavis.com/veterans.aspx or emailVeterans@votebrettdavis.com. Help get Brett on the Ballot! In order for Brett Davis to get on the ballot as a candidate for Lt. Governor he needs to collect thousands of nomination signatures from individuals who are eligible to vote in Wisconsin. If you support Brett, please visit this webpage to download instructions and his nomination papers. 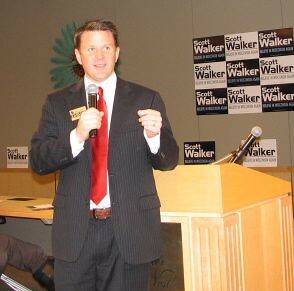 I want to thank everyone who made the Republican Party of Wisconsin 2010 Convention such a success for me, my family and our campaign to make the Lieutenant Governor’s office the leading taxpayer watchdog in the state with the mission to root out waste, fraud and abuse in state government. If you haven’t heard yet, I came out on top of each of the three ballots cast in the lieutenant governor’s race with a margin of at least 12 percent over my next closest rival. I hope you will help us keep this momentum going by clicking here and making a donation of $10, $20, $50 or whatever you can afford. I need your help to make sure we have the resources we need to continue on the fight to force government to spend less and tax less. Finally, please take a couple of minutes to learn more about me and our campaign by watching our new web video. If you like what you see, please click here to make a donation today! • Amended our state constitution to limit government spending at all levels, a proposal known as the Taxpayer Bill of Rights; • Enact strong property tax caps in each state budget; • Stop an increase in Wisconsin’s income tax; • Eliminate a tax known as combined reporting, that has caused many businesses like Thomas Industries, Briggs & Stratton, and others to close their Wisconsin operations; • Stop the implementation of the IPod tax; • Cut state taxes on all cell and land based phone services; and • Prevent an increase in the nursing home bed tax. Looking back on my legislative record over the last 6 years I voted 126 times to cut taxes, totaling $5.4 billion. In addition to these past efforts, just today I helped Rep. Mark Gottlieb announce a constitutional amendment proposal that will force the state to budget like families and businesses all across Wisconsin. These proposed budgeting reforms will stop excessive government spending which will lead to lower taxes and a better job climate in Wisconsin. Help me continue to cut taxes by supporting my campaign for Lt. Governor. Taxpayers shouldn't have to pay for the DNR to run radio ads on behalf of a group that wants to destroy Wisconsin’s hunting heritage. When I kicked off my campaign I pledged to transform the lieutenant governor's office into the leading taxpayer watchdog in the state with the chief mission of rooting out waste, fraud and abuse. Certainly, paying for radio ads to promote an extreme animal rights organization is wasteful spending. If you agree with me that the lieutenant governor should serve as a taxpayer watchdog, pleaseclick here to make a donation to my campaign. State government should not be spending money on radio ads for a liberal special interest group that wants to end hunting in Wisconsin. To get our economy back on track we need to lower the tax burden for families and businesses, which starts by eliminating wasteful government spending. Please donate today and help me put the office of lieutenant governor to work for taxpayers. I recently uncovered a series of troubling e-mails using Wisconsin's Open Records Law showing Governor Jim Doyle's Administration used taxpayer money to fly in a radical "environmental rights advocate" from California to promote a job-killing, tax-raising global warming bill. A bill that is so extreme, that most Democrats are refusing to back it now. It is outrageous that an environmental extremist was flown to Wisconsin, paid for by the taxpayers, to specifically refute General Motor’s effort to educate lawmakers and the public about the impact a “global warming bill” would have on our state’s manufacturing-dependent economy. This all took place before GM made the decision to shut down major Wisconsin operations. If you are interested in learning more about this wasteful use of taxpayer funds, I encourage you to click here to read the full email exchange. I also discussed this issue with radio show hosts Vicki McKenna and Charlie Sykes, who alsofeatured this story on his blog. When I kicked off my campaign I pledged to transform the lieutenant governor's office into the leading taxpayer watchdog in the state with the chief mission of routing out waste, fraud and abuse. Certainly, paying for expensive plane tickets for radical environmentalists is wasteful spending. If you agree with me that the lieutenant governor should serve as a taxpayer watchdog, please click here to make a donation to my campaign. State government should not be spending money on plane tickets for environmental extremists who want to raise taxes. To get our economy back on track we need to lower the tax burden for families and businesses, which starts by eliminating wasteful government spending. What happened to Amelia Earhart? How did the Great Pyramid get built? When will Brett Favre actually retire? There are some mysteries that might never be solved, but I think it is time to finally give an answer to the age-old question of just what exactly does the lieutenant governor do? Earlier today I kicked off my campaign to serve as your lieutenant governor with a pledge to transform the lieutenant governor’s office into the leading taxpayer watchdog in the state with the chief mission of routing out waste, fraud and abuse. In fact, each year I am lieutenant governor I will propose an amount equal to at least 100 times the lieutenant governor’s office budget in wasteful government spending to eliminate. The operations budget for the office of lieutenant governor is set at $390,800. That means I will propose nearly $40 million in specific government spending cuts in first year in office. And, I’ll do it each year I serve as lieutenant governor. It’s time the taxpayers get a return on their investment for having a lieutenant governor. State government spends too much and, as a result, taxes too much. To get our economy back on track we need to lower the tax burden for families and businesses. And, that starts by eliminating wasteful government spending.